Independent research carried out at the Advanced Manufacturing Research Centre (AMRC) has validated what NIKKEN Kosakusho and several Tier One customers have known for some time - that the X-Treme Tool holder is the leading solution for secure rapid machining of Titanium. In closely controlled trials using identical parameters on the same machining centre at the AMRC, the NIKKEN X-Treme came out in front in a series of pre-determined tests to compare damage tolerance, durability, accuracy and gripping power. 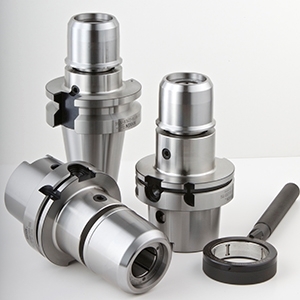 Standard hydraulic and shrink-fit holders were particularly poor in comparison, which is unsurprising as by design they offer no positive cutting tool retention which is a key requirement when undertaking extreme high torque maximised depths of cuts. Other variants which offered key and groove type solutions to safely lock the cutter in to the holder, exhibited micro-creep of the cutting tool out of the holder to take the high precision machined component out of tolerance, at metal removal rates even lower than the X-Treme achieved without movement. 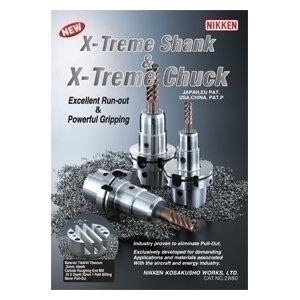 In addition to the superior metal removal rates, cutting tools mounted in the NIKKEN X-Treme holder last significantly longer than all alternative methods due to the superior rigidity of the product negating any radial runout. FEM Analysis of the NIKKEN X-Treme design reveals that this rigidity is due to the unique design and material and subsequent heat treatment used in its construction which was developed in collaboration with the engineers at the AMRC where Nikken have been founding partners since its inception in 1999. 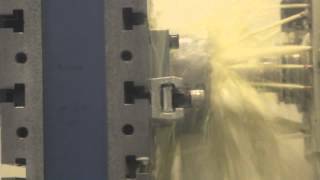 The Nikken X-Treme solution in action removing 267 cubic centimetres of Titanium per minute.